Marine Drilling Company of Corpus Christi, Texas, and Bethlehem Steel Corporation's Beaumont, Texas, shipyard recently commissioned a 200-foot mobile offshore drilling vessel. 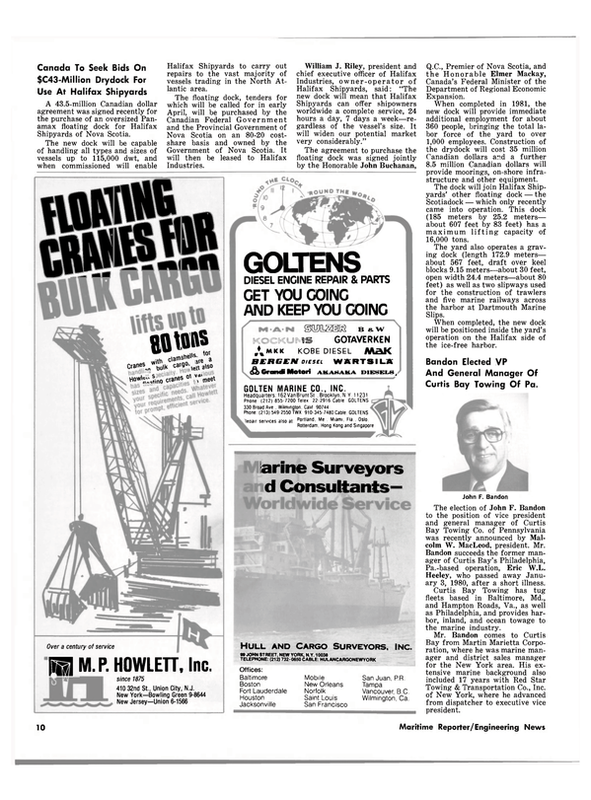 James C. Storm, president of Marine Drilling Company, said this jackup is the first of three scheduled for delivery to Marine Drilling during 1980. During the christening ceremonies, Mrs. Kipling F. Layfon, daughter of Mr.
Storm, commissioned the rig-J Storm XI. Upon delivery, the unit will work in the Gulf of Mexico for Houston Oil & Minerals, as well as Mesa Petroleum. The mat-supported jackup features a cantilevered substructure and offers the capability of being able to position its drill floor over existing offshore production platforms in order to drill development wells or to rework existing wells. On location, the J Storm XI will have a total variable load capacity of 4.5 million pounds and handle hook plus setback loads of 1 million pounds on wells as far as 35 A current A B S T E CH report proves Fluid Film® stands up to 91/2 years of continuous ballasting without rust d a m a g e or re-coating. Now there's solid evidence that Fluid Film® stops rust for years under the most corrosive conditions. 91/2 years ago the ballast tanks of the SS Marine Eagle, an ammonia tank carrier, undergoing modification by Newport News Shipbuilding, were sprayed with Fluid Film Gel (B) White. They have never subsequently been touched upor re-coated [although continuously ballasted at 17-day intervals). The results of ABSTECH Inspection Report #78-269 NN. dated 27 November 1978, are amazing: ultrasonic readings show the steel to feet aft of the platform deck. The maximum cantilever load capacity is 750,000 pounds at the rig centerline. The new vessel consists of a platform that is 157 feet by 132 feet supported by three 11-footdiameter columns fixed to a large stabilizing mat that is 220 feet long and 185 feet wide. Outfitted with deep-well drilling equipment, the rig will be able to operate in waters up to 200 feet deep and withstand hurricane forces resulting- from 100-knot winds and 60-foot seas. The J Storm XI will contain onboard, air-conditioned living accommodations for 50 employees, complete with sleeping quarters, galley, recreation room, laundry and rest rooms, and will be built to comply with U.S. Coast Guard and American Bureau of Shipping standards f o r offshore drilling units.